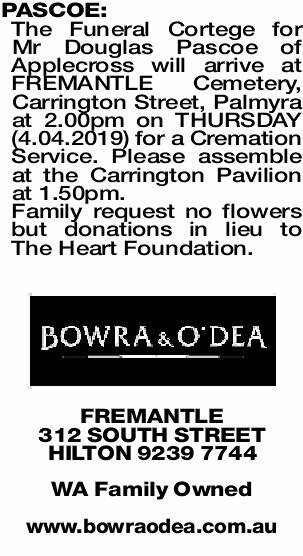 The Funeral Cortege for Mr Douglas Pascoe of Applecross will arrive at FREMANTLE Cemetery, Carrington Street, Palmyra at 2.00pm on THURSDAY (4.04.2019) for a Cremation Service. Please assemble at the Carrington Pavilion at 1.50pm. Family request no flowers but donations in lieu to The Heart Foundation. 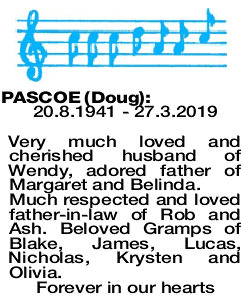 Very much loved and cherished husband of Wendy, adored father of Margaret and Belinda. Much respected and loved father-in-law of Rob and Ash. Beloved Gramps of Blake, James, Lucas, Nicholas, Krysten and Olivia. Deepest sympathy to Wendy, Margaret, Belinda and loved ones. 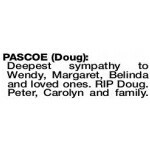 RIP Doug. Peter, Carolyn and family. Doug you were a wonderful man, smart, warm, generous and always great company. Every so often we have an opportunity to share time with someone who has a constant natural ability to smile and have concern for others. Doug was one of those! Sympathy thoughts are shared with Wendy and family. 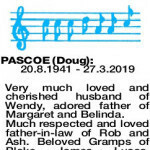 PASCOE DOUG A true gentleman - wise kind and genuine, he will be sadly missed and remembered with much love. 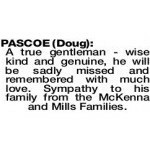 Sympathy to his family from the McKenna and Mills Families. 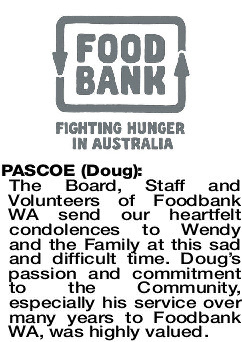 The Board, Staff and Volunteers of Foodbank WA send our heartfelt condolences to Wendy and the Family at this sad and difficult time. 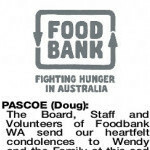 Doug's passion and commitment to the Community, especially his service over many years to Foodbank WA, was highly valued. My deepest condolences to Wendy and family. Such a fine gentleman and Rotarian. Sue Rowell PDG. 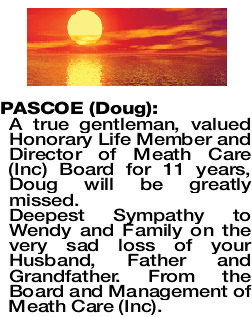 PASCOE DOUG A true gentleman, valued Honorary Life Member and Director of Meath Care (Inc) Board for 11 years, Doug will be greatly missed. Deepest Sympathy to Wendy and Family on the very sad loss of your Husband, Father and Grandfather. From the Board and Management of Meath Care (Inc). 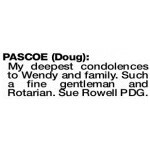 PASCOE DOUG On behalf of Rotary District 9455, we express our heartfelt condolences to Wendy and family on the passing of Past District Governor Doug. 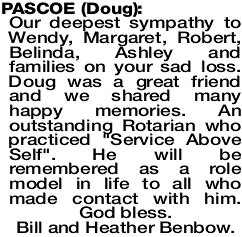 Doug was a committed Rotarian who will be greatly missed by his Rotary friends as will his contribution to the Rotary organisation. Our deepest sympathy to Wendy, Margaret, Robert, Belinda, Ashley and families on your sad loss. 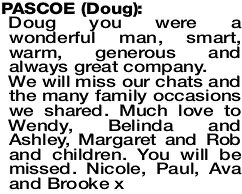 Doug was a great friend and we shared many happy memories. An outstanding Rotarian who practiced "Service Above Self". He will be remembered as a role model in life to all who made contact with him. God bless. Bill and Heather Benbow. 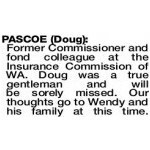 Former Commissioner and fond colleague at the Insurance Commission of WA. 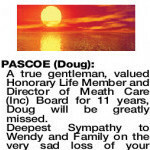 Doug was a true gentleman and will be sorely missed. Our thoughts go to Wendy and his family at this time.